Where rails are welded and grinded, the results need to be checked again for quality control reasons: RM1200 digital is made for this! The graphic display allows to review and analyse the captured raw data immediatley on-site, while additional information can be entered, too. In contrast to its analogue predecessor (= RM1200), RM1200 digital requires neither a mechanical writing carriage nor any scale paper for recording. Thus the measurement results are prevented of negative affection caused by external conditions (like rain or ultraviolet irradiation). 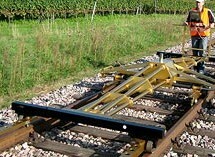 First the required rail bed can be adjusted by using the stop pins mounted on the device bottom side. Afterwards the RM1200 digital will be put on the rail and the cantilever pulled out for stabilization. The magnetic contacts are supporting the right and safe fixing of the device. Finally the data recording unit “Mini” needs to be connected and then device is ready for operation. The data recording takes about 15 seconds only and can be performed either hand operated or automatically. The measurement carriage is moved by a crank handle from start to end position along a 1200 mm distance. 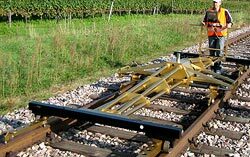 During this process the track surface is scanned and compared to a reference rail. The differences between examined rail and reference rail are digitally recorded in relation to the covered distance and finally saved in the “Mini” unit. The measurement results can be immediately reviewed and analysed on-site. The graphic display offers both, a graphic and a point-to-point evaluation. Furthermore, relevant track data and information can be a added, too. The saved measurement data can be transferred from the “Mini” to any notebook, PDA or PC. Therefore the “Mini” is equipped with a serial or USB interface. As an option there are high-performance software tools (i.e. MultiViewer light, Ril824-Viewer) available, which offer a detailed evaluation of the measured raw data. Both softwares enable a digital filtering and splitting of the raw data into different waves of favoured lengths. The device is insulated and used from the DB. Note: RM 1200digital can be made suitable for grooved rails, too.